"Every day, more and more elderly people arrive at the door asking for help, there are too many to count," he says. If I had saved all those payments in a bank account I would be rich by now; where has it all gone? He sits and smokes in the yard of the Klimaka shelter while he waits for his escape plan - a pension which is due to start paying next March. After paying all his National Insurance contributions throughout his working life, he was expecting a comfortable retirement. But the austerity measures of the last few years mean his pension has been slashed by 60% and the government is considering still more cuts. What is more, if the government goes through with its latest proposal to raise the retirement age, he could have to wait another year or two before he sees any benefits. "I feel like they just stole my money," he says. "If I had saved all those payments in a bank account I would be rich by now; where has it all gone?" Earlier this year the former minister for social security, Antonis Roupakiotis, warned that with government finances in such a poor state they would probably run out of money for pensions by the end of summer. "Based on the data we have, pensioners should be worried," he told reporters. Although the situation has been exacerbated by the current crisis, the Greek state pension system has long been seen as unsustainable. When representatives from the EU and the IMF began visiting Greece in early 2010 they were shocked to learn that the Greek government did not have a clear idea of how many pensioners it had on its books. In the summer of 2011, after an initial census of pensions was carried out, around 32,000 claimants were found to be bogus. The government is now in the process of carrying out a second census and hopes to save up to 800m euros (£626m) per year by clamping down on even more fraudulent pensions. But for those, like Leo, who expected to see decent returns for their contributions to the scheme, the future looks bleak. "Pensioners can't take any more, a red line has been crossed and things are now simply terrible," says the president of the Greek Federation of Bank Pensioners, Ignatios Pliakos. His organisation counts many among its members who have ended up below the poverty line. "I've lived through the military dictatorship when we didn't have freedom but people were not hungry then; this is the worst suffering we have seen in our lifetimes," he says. Alongside shrinking pensions the elderly have been hard hit by rising income taxes, increases in VAT and a list of emergency and solidarity taxes. While the coalition government has recently announced cuts will be gradual in an attempt to ease hardship, it is still expected to make at least 11.5bn euros of savings over the next two years, with 5.2bn euros shaved from pension and welfare budgets. To make matters even worse, it is the oldest generations who are most seriously affected by the cuts in the national healthcare system. One of the proposals currently under consideration by the Greek government is a cap of 1,500 euros (£1,175) per person each year for free health care provision; the elderly - who tend to use hospitals and doctors most frequently - would be hit hardest. The charity Doctors of the World has started a new scheme focused entirely on older people in response to the growing numbers approaching them for assistance. At the organisation's Perama clinic, people sit on plastic chairs and crowd the hall, quietly waiting for their turn to receive medicine and food parcels. Artemis Lianou, who is in charge of the scheme, says many of those who come to the centre are trying to survive on as little as 200 or 300 euros a month. "One 65-year-old we saw recently had diabetes and a heart condition but he could not afford any of the life-saving medicine he needs," she explained. "His daughter was unemployed and struggling to look after her own children and so he was completely without support." Traditionally close ties among Greek families have meant that the elderly were cared for by the next generation but with unemployment skyrocketing among the young that social order is fast breaking down, leaving the old to fend for themselves. Research conducted by Professor Manos Matsaganis of the Athens University of Economics and Business shows that in 2010 and 2011 cuts in pension benefits were one of the primary contributors to a 50% rise in poverty rates. He says the Greek government should have been looking for savings among those who were retiring too early or claiming extortionate sums. "They should have done more to protect poorer pensioners, instead we have seen them hardest hit and the poverty rate among the elderly has increased." One of the most shocking public manifestations of that poverty is the now common sight of old men and women rifling through rubbish bins in the street. For some people the stress and indignity is too much to cope with. In June, residents of the wealthy Athens suburb of Kifissia were woken up in the early hours of the morning by a loud noise. When they went out to investigate they found one of their neighbours, Sotiris Nikolopoulos, lying in a pool of blood in the street. The 77-year-old pensioner had walked a few hundred metres from his house and shot himself with a hunting rifle; he died instantly. In the suicide note the father-of-two left behind he blamed the government's austerity measures which he said left him unable to cope financially. Cases like these still have the ability to shock the public but they are no longer unusual. Until recently Greece had one of the lowest suicide rates in the European Union but in the last two years suicides have increased by 40% and more than 2,000 people have taken their lives, many of them from the older generations. Earlier this year, the very public suicide of another pensioner opposite the Greek parliament led to mass protests on the streets. 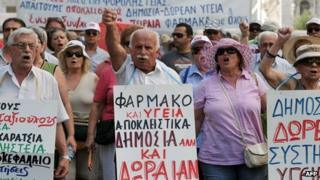 Mr Pliakos, the pensioners' representative, predicts that if the government goes ahead with further cuts to the pension system the relatively small protests by the elderly in recent months will increase. "There's going to be an explosion of desperate people, they are going to take to the streets and it is going to be chaos," he says. Greece austerity: How far still to go?